In the 1960s, when Juan Felipe Herrera was in elementary school, he lived in a homemade RV in Escondido. Like most campesinos, they moved a lot, the boy and his farm worker parents. Today, Juan Felipe Herrera — UC Riverside creative writing professor, activist and artist — is California’s fifth poet laureate and the first Chicano. He was appointed to the position by Governor Jerry Brown in March. These days, with 28 books, an opera, plays and a joy that is contagious, Herrera is still moving a lot, but in a different way. What will that look and taste and smell like during his two-year tenure? What projects will he bring to our classrooms and boardrooms, to our trailers and mansions? But watch out California, because Herrera does not create for comfort. He writes poetry to get your attention, to make you think, to move you. The poem is an artful, funny, sardonic response to the perceived bigotry underlying California’s 1994 anti-immigration ballot initiative, Prop. 187. The measure was overturned in court, but the bigotry lives on and, so, the poem, as evinced in the following excerpt. Herrera has been doing words since he was young. First, his letters: “My mom used to buy me books in the little secondhand store [in Escondido]. She taught me the ABCs in Spanish.” Then, it was the poets, searching for them in his favorite playgrounds — libraries — and discovering Lorca, Ferlinghetti, Pasternak. Speak he does, with irreverence and love, with a soft-spoken poke. Herrera writes the migratory history of California, from Mexico to San Francisco and the fields that connect them; he writes across borders between lands and people. In the end, you know what would be cool? 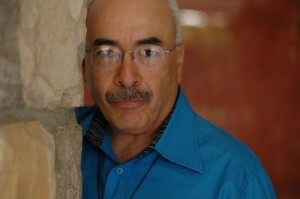 If el Poeta Laureado Juan Felipe Herrera set off firecrackers — vibrant, inspiring firecrackers — that sparked and sizzled and burst a watercolor of words into classrooms and boardrooms and knocked people out of their seats and over walls and into each other’s hearts and minds. Yeah, that would be cool, cool, cool, cool! And he can probably do it, too.